I’ve been trying to feed my family with healthy, nutritious food for about thirteen years now. Before that, I ate just about anything, but one day I began reading books that changed the way I thought. I started to care about nutrition because I cared about my family. Over the next few years, God led me to some nutrition “greats,” such as Sally Fallon (Nourishing Traditions), Weston Price (Nutrition and Physical Degeneration), Henry Bieler (Food Is Your Best Medicine), and Edward Howell (Enzyme Nutrition). We began making some very radical changes to our diet. We started properly preparing our whole grains, drinking raw milk from pastured cows, and eliminating refined sugars. Even with all these changes (and, no, changes like these are NOT easy! ), we still got sick. We had children who were hospitalized with major illnesses. I was diagnosed with a chronic disease. My husband struggled with his weight. Many days, I would throw up my hands in disgust. Why are we even bothering? I would think. Maybe I should just go back to enjoying Twinkies! 1. I’m not always as good at “good nutrition” as I want to tell myself. Yup. Many days I’m just fooling myself. I read all the good books and collect all the good recipes. I hang out on nutrition blogs and associate with friends who believe as I do. But unless I get out of my chair and into the kitchen, consistently, day after day, I won’t actually eat better. This requires discipline in my personal life, and honestly, I’m not as disciplined as I want to pretend. This is a major reason why I still get sick. 2. We will all die. The Bible says that I will die someday (Hebrews 9:27, Romans 6:23). I can’t get around that fact, even with all the good nutrition in the world. It’s appealing to read books that promise that humanity will improve and continue to evolve until we have conquered death, but in reality, we will only conquer death through the sacrifice of Jesus Christ on our behalf. We still sin, day after day, and the punishment of sin is still death. Every time I lose my temper, worry, or continue in other sins, cells within my body die. However, I can be encouraged that good nutritional choices will enable me to have more strength to serve God and possibly a few more years to enjoy life than I would have if I didn’t try at all. 3. Some problems are the result of generations of bad nutrition. Some of the problems with my body were inherited. Some problems really are genetic. Scientists are discovering more each year about the genetic code wrapped up in my DNA. Advances in this area hold a lot of promise for fixing some of our problems, but they also make us more aware of how deeply rooted our health problems are. The exciting thing is that the same research also shows us how amazing the food God created really is! Human research only confirms the genius of our creator God. I’m on the right track nutritionally! 4. Bad nutrition makes things worse. When I occasionally go back to eating Twinkies with abandon, I discover that bad food really does make me feel worse. Maybe my headaches return, the pounds go on, or acne attacks. This tells me that good food really is helping me. It encourages me to keep on keeping on. 5. One diet doesn’t fit all. One of the most difficult parts of nutrition is trying to figure out what my individual body needs. It’s even more difficult when members of one family all have different needs. One of my favorite books is The Metabolic Typing Diet, by William Wolcott and Trish Fahey. These authors have an extensive quiz that readers can take to determine how to fine-tune their diet. Sometimes good nutrition isn’t helping because one person’s “good nutrition” is another person’s poison. 6. Serious health problems require serious changes. Naturopathic physician Ron Schmid tells about his recovery from lime disease, and he notes that “for most people with chronic disease, when it comes to fresh raw or lightly cooked food from grass-fed animals, you can’t eat too much. And the more the better.” In other words, other people might be able to get by with just eliminating some of the bad and adding a little of the good, but if you’re struggling with major health problems, your diet must be close to perfect. This probably means that you’re going to need more support, either from family members or close friends, in order to succeed. 7. What comes out of my body is just as important as what goes into my body. “Don’t you see that whatever enters the mouth goes into the stomach and then out of the body? But the things that come out of the mouth come from the heart, and these make a man ‘unclean.’ For out of the heart come evil thoughts, murder, adultery, sexual immorality, theft, false testimony, slander. These are what make a man ‘unclean’; but eating with unwashed hands does not make him ‘unclean.’” (Matthew 15:17-20, NIV). Even when I eat a good diet, if I’ve got a bad attitude or I’m consumed by anxiety and stress, I’m not going to feel well. On the other hand, some people have a joyful attitude that helps them feel well even when they aren’t able to have a perfect diet. It’s really easy to get discouraged, isn’t it? That’s why we need each other. We need to encourage each other when the going gets tough. I’m thankful for online communities like this one, where I can renew my resolve to eat good food. It’s nice to know that my health problems will teach me valuable lessons that I can use to encourage someone else someday. Others’ health problems will help me, too. That’s why we need each other. 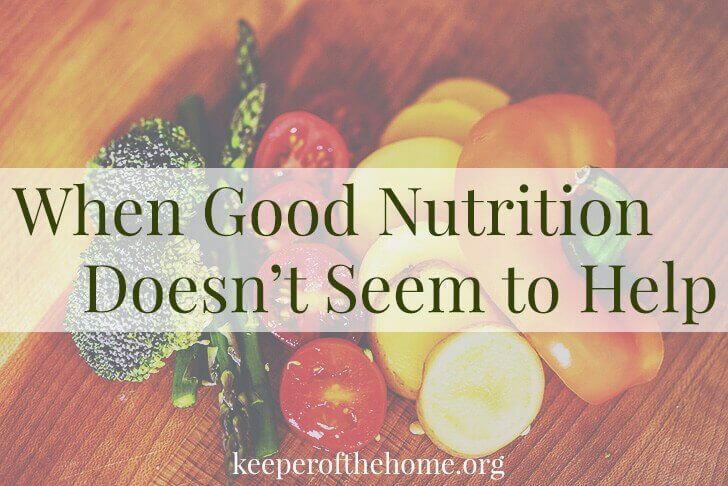 When “good nutrition” doesn’t seem to help, find someone to encourage you and pray for you. Someday, you’ll look back on all this and see a little more of why it happened. I love this. Intellectually, I know I do everything right. Yet, yesterday, at the age of 38, I left the doctor’s office with a prescription for high blood pressure medicine. It’s very frustrating, but for two years I’ve been insistent that I can fight it with nutrition, and have failed in that endeavor. So, I concede and will now take medicine because at 38 with three young kids, I’d rather not have a stroke. But that won’t change the belief that we are healthier because of our real food lifestyle. And that knowledge will encourage me to continue to expend the extra energy and effort to maintain that lifestyle. Great post! Thanks to Anne for sharing that. We are away on a little mini vacation:) Come join me for Crock Pot Wednesday next week. I’d love to see you there. .-= Debbie´s last blog ..NEW FAVORITES WEEK #2 Crab and Corn Enchilada Casserole =-. Thank you Anne for this post! Great information and very encouraging. I also try to feed my family nutritious, fairly inexpensive food that will ultimately keep us all healthy…and that they will eat. It’s not easy you are right, but you made some great points! Anne, this is a great post. I am single and my 81 year old mother and I live together. I am disabled by several diseases but have found that nutrition makes a big difference in how I feel. I’m working on finding what works best for me. One thing I have found is that there are times when I eat what isn’t good for me and not only do I regret it but I ususally pay for it for several days. Makes me wonder why I do it. God is helping me to say no to the foods that call my name. What a timely written piece. I was just praying for a family member this morning who is struggling with a chronic health issue despite my efforts to provide nourishing, healthy meals. (Unfortunately, not everyone in my family eats exclusively at the table during the day and this individual consumes food that is less than healthy and doesn’t exercise). Even with a body that always has to deal with disease, we can feel better if we practice good eating habits. I have long since come to terms with why I continue to work so hard at preparing these foods because at least for me, I FEEL better than I do rather than eating whatever is easily available. And so I’ve started verbally telling my children that we do this so that we function at our best in order to serve God the best we can; that we need to be good stewards no matter what comes into our lives. 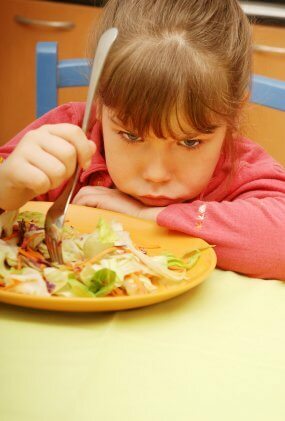 I totally agree that some of our health issues are a result of generations of neglect in the area of nutrition. And this has become a big part of my mission at Homestead Revival: to educate the next generation so that good nutrition is a way of life! Thanks for the article. It encouraged me to press on, be committed, yet be thankful and joyful and not be overstressed about provided good nutrition for myself and the family because that will just negate the good things! We found ourselves at this place when our ‘sickly’ 4yo just wouldn’t get better, even with good nutrition. Turns out that I wasn’t as disciplined as I could have been and stuff snuck in. He needs a dig-down-deep-and-get-strict solution – which led us to starting the GAPS diet for gut healing. And this time the ENTIRE fam is on it for my ease, his ease, and just better health alllllll around. And this time it’s working – he’s healing and we’re all feeling better! Yours points are great! Thx! .-= mom24´s last blog ..How Does THAT Taste?? =-. I find myself in that same place, it keeps us humble. We are not perfect of all-knowing even in our most specialized areas. Thanks for sharing this in such a sensitive and thought provoking way. .-= kara bagley´s last blog ..Grow Your Own =-. Very timely. I was just feeling this way today. Our whole family is struggling with a cold virus & I’m feeling like, “what? Not after all the grain soaking, kefir, sourdough, organic foods, etc” We have only been doing a NT way of eating for a few months & haven’t done it all the way yet (no LF foods, organ meats)- but you echoed my thoughts exactly… I guess it’s like anything else- we always feel we don’t deserve to have anything bad to happen to us. That’s why we complain & struggle in our faith when God allows trying times also I think. Thanks for being willing to be honest as we all wrestle with these types of questions. Thanks for this great post. You are right, it is hard to face our mortality, but we are also called to be good stewards and take care of our “temple!” Kudos to you for trying…some moms don’t even try.